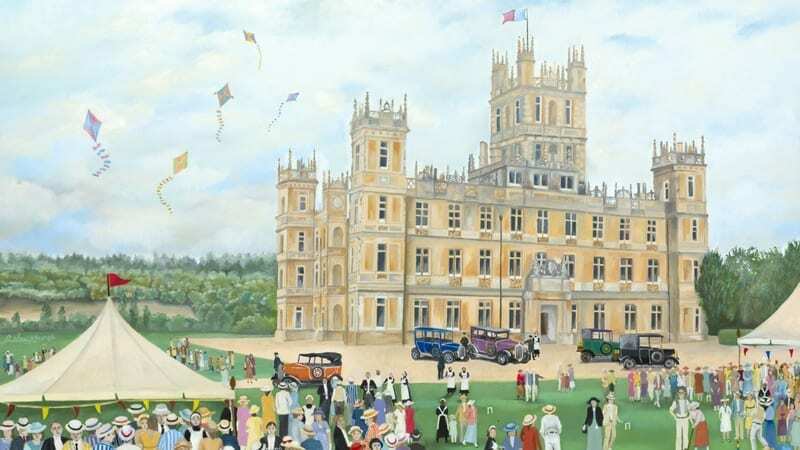 As the sun beams down on Oxfordshire, there’s nothing more pleasurable than a stroll through a county garden – and you can visit the grounds of stately homes in Bampton’s West Ox Arts Gallery (until 21st July) where painter Pip Shuckburgh presents her exhibition ‘Beyond Downton’. Well-known for her scenes of setting from TV series Downton Abbey, this is a chance to explore her other work. Pip’s paintings also include colourful circus scenes. “I always wanted to be a theatre designer, and spent many happy hours as a child making sets for a theatre my Father had made for me,” she explains. “I think this way of seeing the world comes through in my oil paintings where I choose a striking backdrop and then add life, people and activity at the front.” Interestingly, Pip alternates between painting these richly populated paintings and others that contrast entirely and convey a flavour of solitude. These might be a single house in a bleak landscape, a line of repeating topiary, or an oil refinery that has become almost abstract. “When I have finished a busy scene, it’s almost as if I need to retreat from the people in my painting just as you do in real life after a party or a trip to London,” Pip muses. As a child, Alan loved myths, legends and fairy stories, the German Struwwelpeter cautionary rhymes and traditional tales from Russia and Eastern Europe which were harsher than the softened versions that children hear today. ‘I’ve always loved children’s books,’ says Alan, ‘because I love the combination of illustrations and story.’ His pictures are surreal, captivating and fun at first glance, but look again and you see that despite their apparent peace and restful palette there’s often a hint of disaster hanging over the characters, just as there might be like the real world or a message to discover. It’s up to the viewer to allow their own thoughts to develop from the picture in front of them and complete the narrative, and with the array of suggestions and themes in this exhibition, there’s a whole world to explore. Childhood is a theme that appears down the road in the Sarah Wiseman Gallery in this month’s exhibition ‘The Garden’ (runs until 28th July) in which artist Sarah Lacey, seeing the world through her young daughter’s eyes, has sought to depict the garden as a place of play and discovery. In every garden is a slightly abandoned patch – behind the shed or underneath a hedge, where there’s chance of glimpsing the mythical things that adults can no longer see or understand. Sarah’s work is largely influenced by natural and rural history and literature, and a childhood spent holidaying in the Scottish western highlands instilled in her a life-long love of nature, reading and myth. In each of her small pen and ink drawings, she documents motherhood, early childhood or small things that have caught her imagination.